How can I create add-ons? HOME > REVENUE AREA > How can I create add-ons? The Hotel can setup aditional services (add-ons) that will be displayed in the booking engine to the guests after the reservation is completed. This will ensure that up selling or cross-selling does not distract the guest to select and book a room at your hotel. STEP 1: To create an add-on, go to the REVENUE tab and from the left navigation panel, select below the option ADD-ONS. NOTE: On the left navigation menu you can filter add-ons according to it's status: ACTIVE, INACTIVE or ALL. STEP 2: Click on NEW. Price - can be "per unit" or "per night". Strikethrough Price - To highlight this is a special offer you can add the "old price" to the strikethrough price field. Tax - add aditional taxes for this service only. Link to add-on page - add a link to a webpage with further information on this service or insert an external link. STEP 4: Add an image, by clicking on ADD MEDIA. it is possible to configure some restrictions for the add-ons as well, according to room type, sell date and active period. 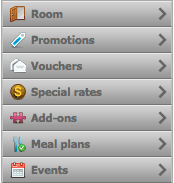 How does this add-ons will appear on the booking engine, after making a reservation? Add-ons are visible in the page "Aditional Services", but they are not available to book from here. Add-ons (and Vouchers) will be presented after the guest has committed to the reservation in the booking engine, ensuring that up selling or cross-selling does not distract the guest from the main task at hand – selecting and booking a room at your hotel. How many Add-ons can a client buy per Reservation? This will depend if the Add-ons are configured as "Per Night" or "Per Unit", and the number of guests of the reservation. How can a client add more units to the reservation? You can order the add-ons appearance on your booking engine just by clicking on .